1. 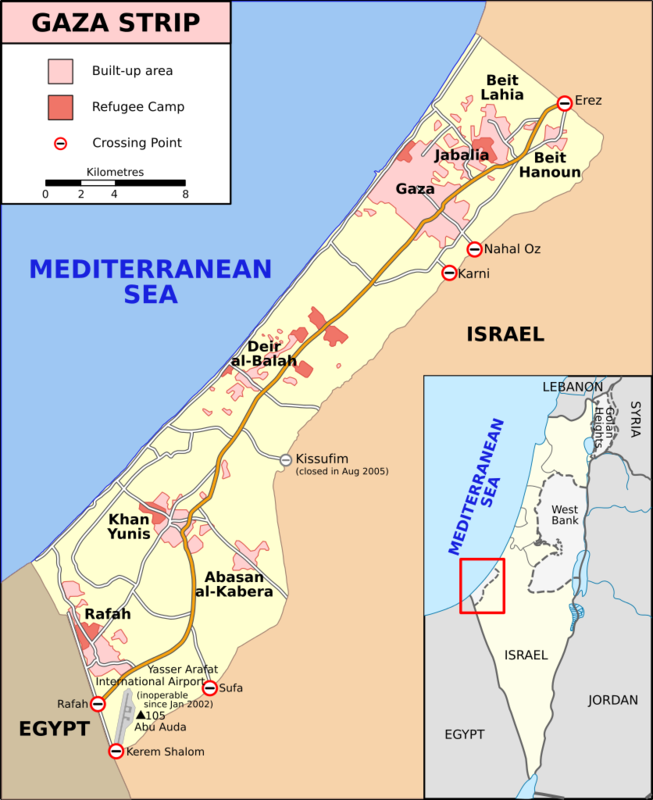 Gaza was invaded by Israel in 1967 ever since Israel is illegally occupying the whole of the Gaza strip. 2. Gaza is surrounded on three sides by Israel who has blocked all these three sides by Israeli army. Navy. One side is border of Egypt where the Egyptian army along with Israeli UN observers monitors blocks the entry of any body from/to Gaza. Gaza is literally huge prison where not even a bird can enter without Israel’s permission. 3. Gaza has no sea port or airport or even a train station. 4. Gaza residents cannot leave Gaza as they don’t even have passports. Plus there are Israeli checkpoints at every place. Also no one from any country can enter Gaza without Israel’s permission which is impossible to get , forget about ordinary man even the top politicians of powerful countries had been denied entry in Gaza by Israel. Gaza is a place which is totally cutoff from the rest of the world. 5. Each and every daily use commodities comes through these Israeli check points. Even the milk, wheat medicines all items come through these Israeli check points. Israel charge taxes on all the items witch goes through these check points. 6. Gaza is like a big jail. It is entire country under seize. Even inside Gaza Israel have several check posts at important junctions. The Israeli army harasses and humiliates Gaza citizens every day as the Gaza citizens cross these check posts. 7. The UN has urged Israel numerous times to remove this illegal seizure of Gaza but Israel never listen to UN . More than 50 resolutions have been passed by UN against Israel but with USA always on its side so Israel just doesn’t care. 8. The food and essentials are always in short supply in Gaza as Israel delays, discourages and harass its imports in Gaza. Shops don’t have enough rations, hospitals don’t have enough and essential medicines. Power is in short supply, petrol and gas is in shortage too. The inflation is highest in the world in Gaza as a result of it. The poverty is rising at the highest rate also. The Gaza children’s are among the worst malnutrition children now. 9. There are no specialized doctors or equipments to treat the serious injury or disease in any hospitals. 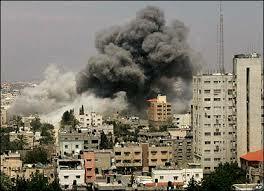 Every now and then Israeli army bomb Gaza and the innocent civilians get hurt during bombing. These wounded civilians plead and beg in the check points to let them out for treatment but they kind Israeli army never let them. So the wounds which could have been treated become more severe and often the wounded becomes handicapped for the rest of their lives. 10. Once a thriving society and rich people now have become beggars / prisoners in their own country.Can you imagine the trauma, the humiliation, the harassment, the pain in the hearts of these people who have been invaded and made prisoners and slaves in their own country? They have been struggling for their independence since almost 50 years now. With each passing day Israel is constructing new settlements for its Israeli citizens in their land. With each passing day their hope of independence, a hope to live a normal life like any other human is fading away. Every night they sleep in pain and every morning they wake up with sorrows. In the pretext of peace talks Israel actually is delaying their independence to capture more and more of their land everyday by constructing new Israeli homes and settlements. The Palestinians know this and they are watching it helplessly. Just like a goat watch the lion eats its children but can do nothing. They are shedding tears of blood. With Israeli soldiers harassing them , cursing them, abusing them mocking them, hurting them , killing them everyday in their very own land, all Palestinians can do is watch and cry. What suggestions do you have now? The western paid media is making broadcasting news in such a manner that one should feel as if Gaza residence are the one who are occupying Israel and Israel is fighting for the freedom of its citizen. So that people can only curse and blame Gaza residents. Can you try to feel their misery and helplessness? We can not even imagine spending even one day in the jail called Gaza and they are living there everyday. This entry was posted in Politics and tagged Gaza, Israel, Palestine on August 13, 2014 by akhterhayatmalik. This was the statement given by NS during a laptop distribution ceremony this week. No doubt Mr. PM, the world that you see and the real world of the have-not that exists around us (and shown by media) are far apart. Your world is the world of palaces, bullet proof vehicles, thousands of security guards and their world is defined with hunger, poverty, lack of shelter and lack of security. Your world is the world of business empires spread from Dubai, to London and to every nook and corner of the globe, their world is confined to joblessness, diseases, robberies and deaths. Your world has lot of crown princes and princesses who are waiting to take your place, their world sees a bleak and dismal future for their children with no chance of getting even a respectable job on merit. Yes Mr. NS, both the worlds are hell apart, because you are PM of Islamic Republic of Pakistan and your 180 million subjects are sons of a lesser god. Not surprising at all.. 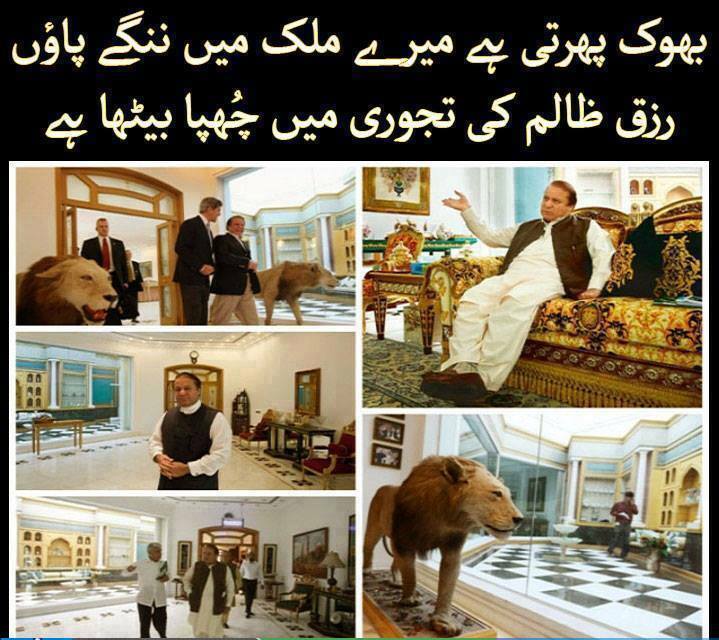 This entry was posted in Politics and tagged Democracy, Nawaz Shareef on August 13, 2014 by akhterhayatmalik. Why Justice is not possible under present setup? Under these circumstances it is impossible for the victim party to get any sort of remedy or justice. Dr. Tahir ul Qadri had done well to reject the judicial commission formed by the govt. PTI, PML-Q and MQM have also supported the stance of PAT and have demanded an immediate resignation of Shahbaz Sharif as CM of Punjab. IK has demanded that Rana Sanaullah should be arrested and put in jail. How ‘Qisas’ can be Taken? It is obvious that ‘Qisas’ ( life for a life and organ for an organ) can materialize after revolution. When the present set up will be replaced with a revolutionary council of the people of Pakistan it will set up an independent inquiry commission. 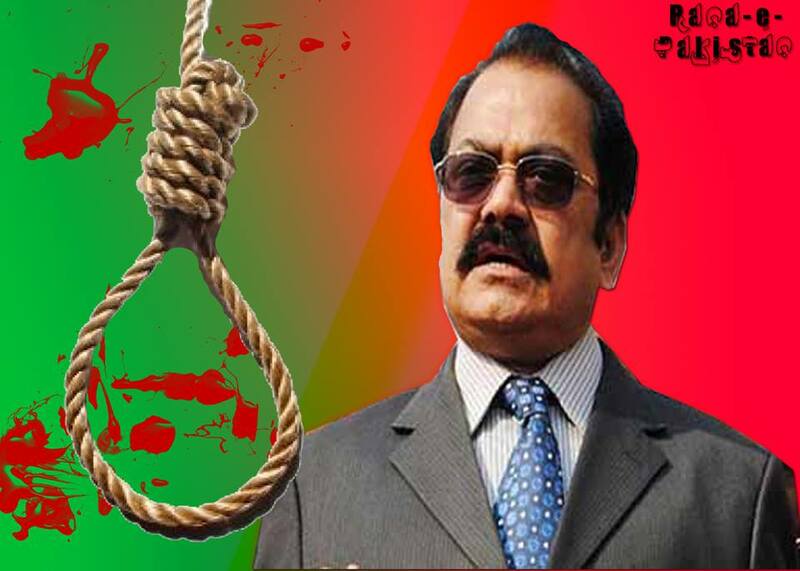 In the light of that inquiry report an impartial court will carry out hearing of the case and after satisfying itself with all the available evidences, will sentence the killers to death under the Islamic law. The revolutionary govt will be so authoritative that no powerful group or mafia will be able to influence the investigative process or the witnesses or coerce the victim family for a compromise. Allah (SWT) has commanded in the Holy Quran that “o you wise and thinking people, there is life in ‘Qisas’ for you, so that you become fearful (of Allah) .” Without enforcing the concept of Qisas there can be no peace in our society. This entry was posted in Islam and tagged Islamic Law, Lawlessness, Punjab on August 13, 2014 by akhterhayatmalik. THE GOVT HAVE ACTIVATED MILITARY FRONT, WILL THEY ALSO ACTIVATE DIPLOMATIC AND PENAL FRONTS? A full fledged and comprehensive operation has been launched in North Waziristan by Pakistan Army to give a final blow to TTP and other terrorists. PAF, Army Aviation and ground troops will participate in the operation. The operation will continue till last terrorist is eliminated and final victory is achieved. When I first saw this breaking news on TV from ISPR I thought that Army has taken this initiative at their own, bypassing the govt. But then the same statement of ISPR flashed the words that the operation has launched under the directions of the govt. As usual the govt was nowhere visible, till Kh. Asif and Pervez Rashid gave befitting statements. As a matter of fact I wanted to see my PM active and in action at this crucial moment. A press release from Min of Interior should have declared this operation instead of ISPR doing it. This should have been followed by a brief address of PM to the nation explaining as to why the dialogues with TTP have failed and why the operation has become unavoidable. The next day the PM should have taken the Parliament into confidence on this event of national importance. But alas! 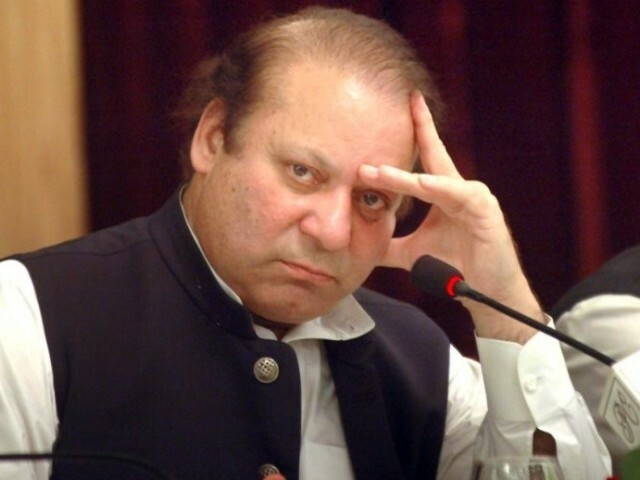 the statecraft still remains illusive to our 3rd time PM.. 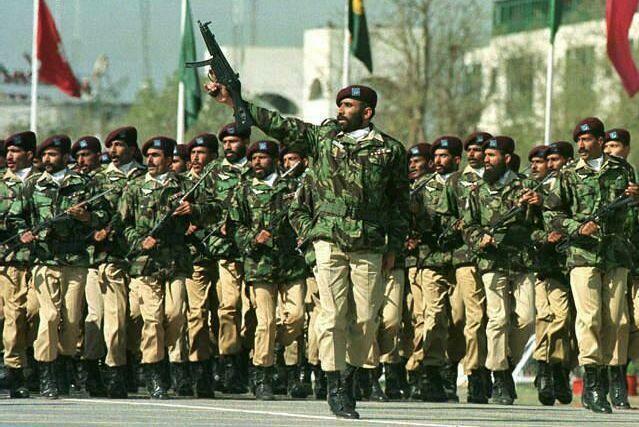 I am sure the military will do its job well and proper as they have done in swat and SW. Many terrorists will be killed, some will be apprehended but many will escape also. Collateral damage will also take place as is the case in any war. NW has a peculiar position as there will be some strategic interests at stake in the shape of Afghan freedom fighter (call them good Taliban). The problem of IDPs will be pronounced. Many civilians will migrate to Afghanistan also. After few weeks the Army will take control of the area as they did in SW and will deny a crucial space, base and hideout to terrorists. But the terrorists will flee to other tribal agencies and will even take refuge in settled areas where they may still find lot of supporters and sympathizers. Many of them will take refuge in Afghanistan and will continue their activities against Pakistan from their safe heavens. Though Pak Army has requested the Afghan National Army to destroy the hideouts of TTP in their areas but neither they nor the US/NATO will render any help to us in this regard. Afghanistan is the most important factor. For a lasting peace we must have a friendly or at least a neutral govt there. A hostile govt there will neither cooperate with Pak nor will they eliminate our escaped terrorists. Here comes the diplomatic acumen of Noon govt and how they deal with this factor. Similarly Indian interference and their support of terrorists need a diplomatic initiative. Will NS be able to do that? Terrorists and their supporters will take refuge in cities as well. Many TTP and other terrorists who are sentenced to death are still in jails. Will the govt execute them? We are at war and this menace cannot be dealt with through peacetime procedures like registration of FIR, witnesses, civil courts etc. Will the govt improve these procedures to quickly punish the killers, or they will be kept waiting in jails till they are freed through a jail break? Our civil governments have miserably failed to tackle post war scenario in Swat and S Waziristan. It is yet to be seen as to how the govt will act in present situation. It is not recommended to spread Pak Army in all nooks and corners of the country and leave aside the civil rehabilitation work. This entry was posted in Security and tagged Military Operation, Pak Army, Taliban, Terrorism on August 13, 2014 by akhterhayatmalik.